Patty: How well I remember. He absolutely lived on coffee, sweets and cigarettes. In looking back,that probably is why he died so young. I sure miss him. The husband of my best friend since high school and a real life cowboy. He loved our farm with all its wide open spaces and wonderful pastures. He brought up those four gorgeous Tennessee Walker mares to live and reproduce on our farm. Young Lady MacKay, Joe’s Country Music, Chocolate, and Minnie. His stud, Sultan, was his pride and joy. Johnny was always everyone’s favorite, but only JP could ride him. He was JP’s horse. And the most well-mannered, fastest horse I’ve ever seen! As the years went by each one had his or her own horse, some were more interested than others. To me it was the very best way to get a teen-ager to pay attention to something other than him/herself. When you’re riding, or working with, a great big horse you have to pay close attention to the horse. It was wonderful training for all of us. I learned as much as the kids. I have never forgotten Gail’s contribution to all of us. I remember the day they buried him. I planted dozens of daffodils in his honor. They bloomed and multiplied for some 20 years. Then, due to the help of some inexperienced gardeners, most of the bulbs got dug up and thrown out. I didn’t even know they were gone until the following spring. Today I have 150 new bulbs ready to plant……again, in honor of my good friend Gail Davis. JP: Gail Davis – my first mentor, long before I knew what that meant. I had wanted to be a cowboy for as long as I could remember, and here was a man with boots, hat, and a saddle. He brought with him smells of leather, tinged with sweat and horse hide. Then he’d climb aboard one of those big horses and ride up a storm. It didn’t seem to matter that the horses weren’t used to being ridden. He’d work them into shape and have them minding their manners in no time. Learning to ride was a big deal for me. I wanted to know more about horses, but in a wishful way – like wanting to win the lottery. The chance came when Gail offered to teach me to break and train one of the young stock and I’ll never forget it. I was in 8th grade, and playing football after school. After practice, I’d walk to the Davis’s house just outside of town. I learned the basics – lunging, grooming, and handling an animal much bigger than me. Most of all I learned how to guide and reassure my horse, earning his trust. And my relationship with Joe’s Johnny Cash would become one the most important of my lifetime, lasting nearly 20 years. Somewhere along the way, I realized Mr. Davis was more than a cowboy, he was a horseman. He had a firm hand, but worked more through steadiness than strength. He was demanding, but absolutely fair. And he loved his horses. He earned a horse’s trust by understanding and respecting them first. With Gail in the saddle, a horse knew he could surrender control because Gail would look out for him. Often, they did things they ordinarily wouldn’t have – because Gail asked them to. And if he asked, it must be okay. 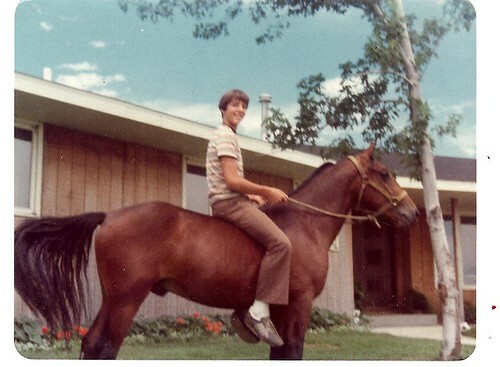 I never thought much about these things while growing up – how much I learned from Gail, or how I wanted to be a horseman like him. He had his own family with kids my age, yet found the time to share his passion with me. I started working with horses more and more, never looking back. When he died suddenly, I didn’t know what to do. I realized what a profound gift he’d given me so many years ago. And although I deeply regret never having thanked him, I see a new way I want to be more like him. Pat into greased 9″x13″ cake pan. when they start to melt, and are still hot, spread them around with a knife or rubber scrapper to make your “frosting”. Great story — and I can’t wait to try the recipe! This is the kind of post that I absolutely love. One filled with memories and a recipe attached to it. What a great blog you have here! Another winner! What a wonderful story. It’s funny how things that we should realize end up being a cherish and wonderful gift. i love recipes that are reminders of ones who are special to us. thanks for sharing. What an amazing post. I love cowboys and I love toffee! Thanks. I’ve thought a lot about that. I think it was Gail’s way of drawing attention to Sean. Sean was the fifth of five children, all born within six years. He was a happy little guy. Every picture we have of him has his cute little smile. But, cute as he was, I think he got precious little attention. I was pretty overwhelmed! Gail really liked him and kept calling him “Doug.” He’d tease him saying that was his real name. They would go round and round. Sean just beaming all the while! That Gail, he noticed everything, even the little kids and their needs. Clarification: Sean was the fifth of five children born within six years. Six years later the Mickster came along to be the baby of the family of six. That looks so good and easy to make. Xmas present idea!! Mary, your Toffee Squares are BEAUTIFUL!!! Ours never looked that stunning. Maybe it was because they never lasted long enough to get them to a plate! Loved reading the story, and the vintage pictures. 🙂 Oh and the recipe looks pretty darn good too! Thanks for the wonderful story. Thank you for the toffee squares, I’m receiving them right now. 🙂 It would be a great gift to give. wonderful recipe with wonderful story! it’s just sweet to remember one good friend in life! What an awesome story. And you had me at toffee….that is one of my weaknesses! I’m going to have to make these. What a great blog post! The recipe looks fantastic too! Great story and beautiful photos. Thanks for sharing your passion through writing and recipes. The whole stack looks great! 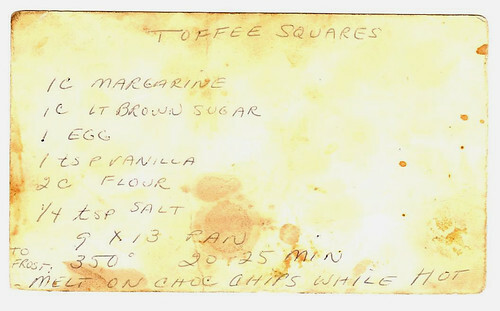 Always love toffee squares. They look so good. My mouth is watering. I don’t care what those toffee squares taste like… The picture looks good enough to eat. Well… I do care… the recipe looks great, too. I’ll be making these this week. Thanks for sharing the great recipe and the touching tribute to your friend Gail. I loved reading your memories. Thank you for sharing this touching post. Oh no thank YOU Yvonne! YUMMMMMMM THEY LOOK SOOOOOO GOOD!!!!!!!!!! and I LOVE THAT STORY!!!!! Hi! Looks DEE-LISH! I’m wondering if you have any tips on how you cut them so the choc didn’t crack? No tips – I just let them cool completely so I could get a clean cut, but didn’t even think about it cracking and it didn’t. 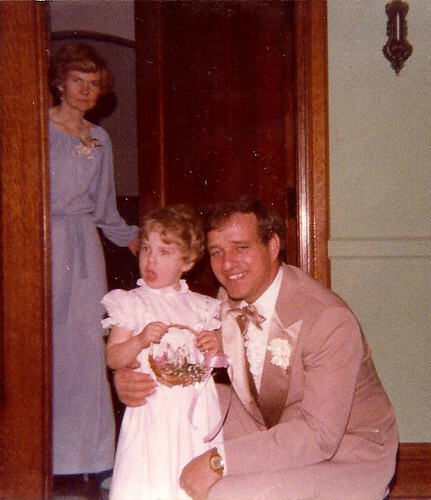 I am Gail’s granddaughter and I just wanted to thank you for sharing this story! He died when I was 7 years old but I still have many wonderful memories of him. To me he was larger than life and at the same time as gentle as can be. I learned so much more about him through your post and it meant so much. I just had my first baby (a little girl) 4 and a half months ago. I think she will someday get a kick out of hearing about her great grandpa the cowboy! Who knows, maybe she will get into horses one day. It’s so nice to ‘meet’ you and to know that the story reached your family! I’m assuming you’re one of Cheri’s kids. I often think of her and her charming, quiet ways. I hope to see her again some day and meet all of you! Congrats on your brand new baby girl!!! How great to hear from Cheri’s daughter!!! That was a phenomenal post! I hope you saw the part, in the comments, about how Gail always called Sean ‘Doug’. I am so glad that this blog was brought to my attention! I am also one of Gail’s granddaughters (Cheri’s youngest girl). My mom just sent me this link. It was so fun to learn more about my Grandpa. I was five when he passed, so I have just a few memories of him. I do remember how he loved to play with me and Rachel when my Mom would leave us with Grandpa while she had to go somewhere. I definitely remember his sweet tooth! My Grandma had one, too. I always knew I could count on getting something sweet when I went to Grandma and Grandpa’s house! It must be genetic because I have a major sweet tooth myself! 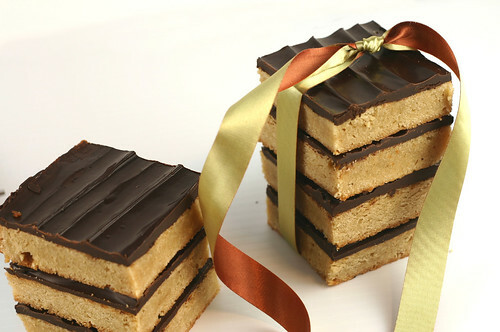 I know I will love these toffee bars! I always brag to my husband about how my Grandpa was a bonafide cowboy! I miss him and I wish he were still here. I’m sure he would be tickled that now his Granddaughter lives in Cookeville, TN! Oh how wonderful to hear from you! He would be tickled about you living inTN and even more so if you were out riding horses! Thank you for stoping by and I surely hope to meet you as well some day! I’m SO THRILLED to see two of Lois and Gail’s grandchildren here on foodo!! We met before, when you were very young. Lois and Gail were THE MOST loving parents. Cheri was truly the apple of their eye. She was so beautifully loved…….it shows today in the loving family she has in all of you! Lois was my ‘best friend’ all through high school and long thereafter. Gail was her hero. He played the role well. His ready smile and kind manner had a calming effect on people as well as horses. Truly a gentle man. What a pleasure it was to know both of them so well……..and now to touch base with you again as adults with your own children!